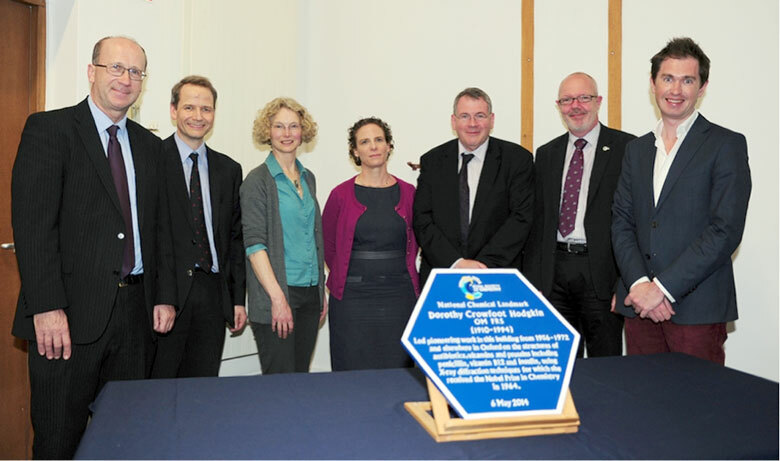 The Royal Society of Chemistry has awarded a new National Chemical Landmark blue plaque to the University of Oxford Inorganic Chemistry Laboratory, to celebrate the 50th anniversary of Britain’s only female Nobel Prize winner and to coincide with the UN International Year of Crystallography 2014. Dorothy Hodgkin won the Nobel Prize “for her determinations by X-ray techniques of the structures of important biochemical substances”, including the structures of the antibiotic penicillin and vitamin B12, a treatment for pernicious anaemia, thereby augmenting the synthesis and production of these compounds. Later she and her colleagues also determined the structure of insulin, the hormone responsible for carbohydrate metabolism and employed therapeutically in the management of diabetes. 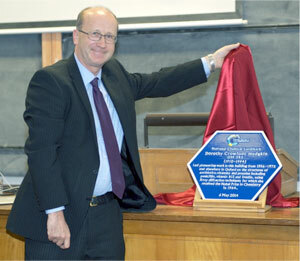 The occasion was marked with a special symposium in the Inorganic Chemistry Laboratory featuring lectures by Professors Susan Lea , Paul Raithby and Andrew Goodwin discussing their work in the field of crystallography, and how the field has changed in the 50 years since Hodgkin’s Nobel Prize. Science writer Georgina Ferry, who wrote a biography of Dorothy Hodgkin and the play, Hidden Glory, outlined Dorothy Hodgkin’s journey to the Nobel Prize. The audience included current staff and students from across the University, as well as some of Dorothy’s family, colleagues and former students.